It goes without saying that keeping food preparation areas clean is of the utmost importance but this is just as true for the component parts of a kitchen. Every aspect of the kitchen contributes towards its functionality and needs to be considered in terms of health and safety and the extractor hood is no exception. 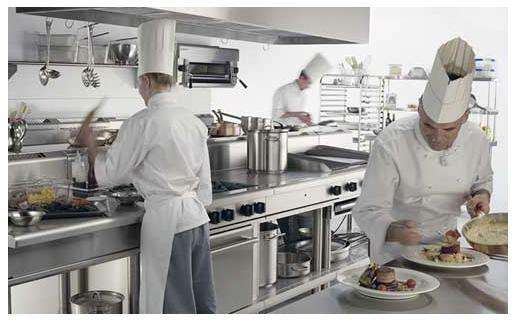 In fact the extractor hood plays a vital role in maintaining a clean and pleasant working environment in the kitchen. Helping to draw out fumes, steam and smells the extractor hood helps to keep the air clear. However, in its position at the heart of the action it is easy for extractor fans to become blocked and full of dirt from the grease sent up from the oven and hob below. This build-up needs to be dealt with and the extractor kept clean for two main reasons: hygiene and fire risk. Imagine just how much grease gets sucked into the extraction system of a busy kitchen day after day. That is a considerable build up, lurking there just behind the exterior providing a fertile ground for bacteria to thrive. If levels build up enough there is a chance that the extractor hood might develop a leak, or that debris may pass back into the kitchen. Even more pressingly is the fire risk presented by a blocked extractor hood. The extractor hood is an important part of a kitchen’s ventilation system and if the vents are left to become clogged by grease the system will no longer be able to function to its full capacity. Good ventilation is a health and safety requirement. An extractor fan that has become blocked with dirt and grease is a serious fire risk – in fact 70 per cent of commercial kitchen fires have been attributed to faulty extractor systems. To prevent a risk of fire, extractor hoods should be cleaned regularly while the ductwork behind the hood should be professionally cleaned as often as every three months in a kitchen that sees heavy daily use. Keeping a clean extractor fan is an essential part of maintaining a kitchen in good working order. Are you looking to upgrade your kitchen facilities? Get in touch with Caterline Ltd today and let’s talk about design options and equipment choices.